Markus. 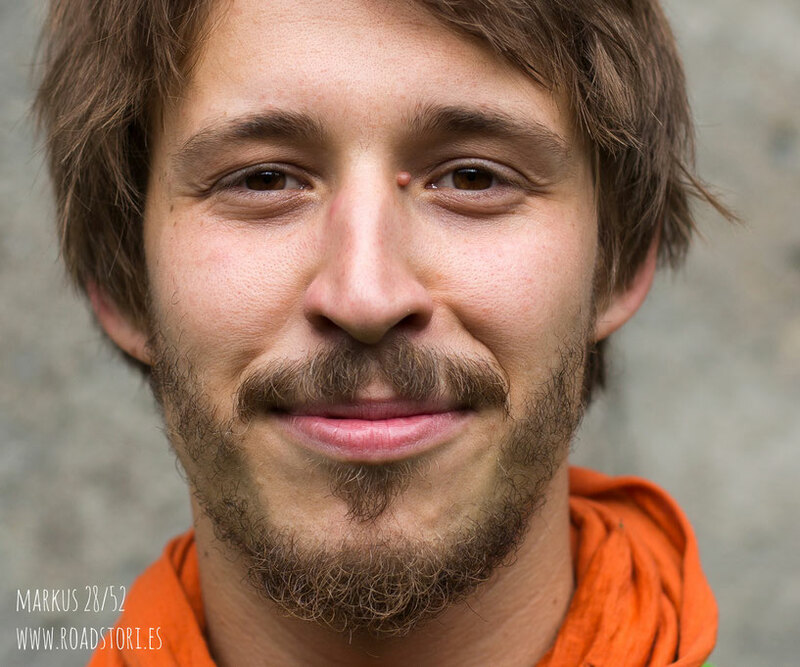 The friendliness in person, passionate climber (because of where he comes from), football fan (because of the tactic), studied Economics and Development in Bayreuth, then did his carpentry apprenticeship. He lives in a self renovated communal house near Bonn and is the boyfriend of my very first Roadstories Portrait, Christiane. Hmmm...In my experience, my happiness is very much connected to my stomach. Food definitely makes me happy! Its often much easier for me to identify what makes me unhappy than what makes me happy. And I'm not a very pleasant person to be around when I haven't eaten. For sure, doing things outside my comfort zone makes me happy. Everything else though, even things which result in positive outcomes, like spending a day working together on the house, don't really make me that happy. I suppose for me, happiness is more connected to the moments in which I really have to push myself out of my daily routine or comfort zone- when my limits and abilities are really put to the test- such moments, for a short while, make me very happy! In long term, it's exactly the opposite. It's important to me that I am surrounded by cool people, that my workload is self-determined and that the projects I work in are both such which I can identify with and that challenge me. Last but not least in a project, I desire to have a strong feeling of a group pulling on the same string, of being integrated in a collective process. I am definitely unhappy when everything seems to be random and I can't see where things are going. A while ago, I hadn't always had a clear vision - I was sort of drifting without direction. By now I manage to develop a clearer idea of my future goals, and I am a lot happier. Since I moved out of my parent's house, I have always considered the places in which I have lived, as home. I am probably like most people, a creature of habit. In this way a place can very quickly become a home, the easier it is for me to engage and integrate myself into the new surrounding the quicker it is for me to feel at home. When I get to shape and take responsibility for the surroundings in which I live in, the process of making a place a home is much quicker...but even then, it doesn't take long for me to feel at home. I no longer consider my parents house as “home” though, and strangely enough I have a friend visiting me at the moment, who always refers to his parents house as “home”. I struggle with this, because I have a very different understanding of home. I think home is very much linked to where one sleeps and recovers/rejuvenates. It is also a larger environment though, in which one is intimately incorporated. At the moment it is also very important to me, where Christiane is. When we were living separately in Bayreuth, I also considered where she lived to be my home. At that point she was living in a communal house in which I was well integrated and knew everyone. An essentially life changing decision I recently made, was not to carry on studying after completing my BA, and instead to follow a very different profession. One of the main reasons for this decision, was the realisation that in order to feel happy or content at the end of the day, I need to be able to see what has been achieved. This physical appreciation was hardly present while studying and neither in the future work it leaded to. The decision to become a carpenter fits much better to my character. I found out that I really appreciate the physical work that comes - amongst others – with this profession! In retro-perspective the decision to change my professional subject was very far-reaching for my entire life. .
As a first step we actually wanted to rent a flat in Bonn to experiment on living together, but since we couldn't find one large enough we decided to buy this house with the help of an association called “Freiraum Alfter e.V.”...in this way we have sort of realised some of our long term plans a bit earlier than expected. It's still not clear how this project will proceed after we have completed the renovations, but I suppose we will tackle that questions next. What else was definitive...I'm sure there were moments in my childhood, but nothing really important springs to mind. The decision to study in Bayreuth being the decision not to study in a big city was very incisive for my development. I am not really the kind of person who thrives and feels comfortable in big aggressive environments and self-display. I think entering into such an institution I would probably have foundered. Bayreuth, on the other hand, is a personal environment in which I felt I could comfortably evolute. Moving away from my family and hometown environment with the expectations and projections on my person has been very good for me. Many of my ideas and ideals I now stand for have developed in this period due to my new social environment. Bayreuth gave me a good compass for life. Earlier on I don't see decisive crossroads (or I just haven't elaborated the connections thoroughly). My childhood and teenage years were unspectacular. There weren't really any drastic or dramatic experiences... This in itself, however, is also very formative. Debby's question: Do you think your thoughts create reality? Why or why not? Yes, I definitely believe that! This links directly to my job. Everything I make is the transformation of a thought into a physical reality. All the planning is in the form of thought or concept which can then be transformed into real material objects or actions. In economics it's a bit more abstract, but the concepts developed there spread and determine our actions. See for example how our notion of money determines the way we behave in reality. I think that the majority of our society is built on thought constructs which economists, for example, try to bring into being. Markus's question: Do you ever think about radically changing your life?